If that is not 'Shopped that is truly spectacular and quite unbelievable! 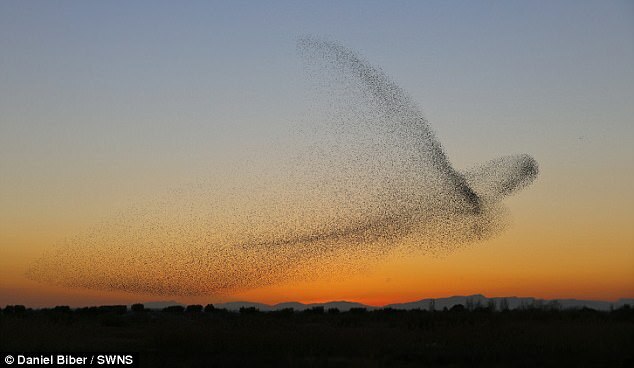 A photographer claims to have captured the perfect moment a murmuratuion of starlings took the form of a giant bird. 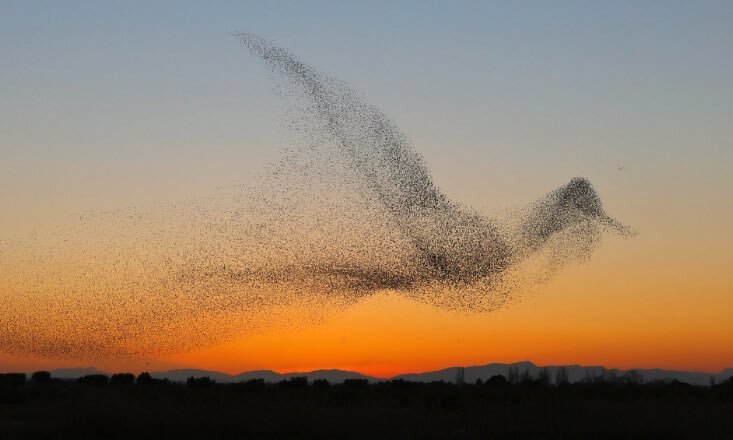 Daniel Biber, 53, said he captured the breathtaking snap in Spain, after observing thousands of birds and scouting locations over a four-day period. Like clouds in the sky, the giant flocks often take on weird and wonderful - and sometimes graphic - moving forms and shapes. And the birds appeared to have made for a startling spectacle when they assembled over the Costa Brava in northeastern Spain, in front of Mr Biber's eyes. There are a couple of more images there. Murmurations are so transfixing to watch. How in tune one is to the next. Nature's ultimate "Synchronized Swimming" so-to-speak. Not long ago I was watching a video where all these people were taking footage of what they believed was some organic ET/UFO phenomenon. I took one look at the video and said "That is a Starling Murmuration". Most often, one doesn't have to think outside our planet for a terrestrial phenomenon that looks extraterrestrial. Agreed, Aros - totally amazing. I wonder what flocks of passenger pigeons must have looked like. One of Adelaide's AFL teams (the national Australian football league), the Adelaide Crows, advertise with computer-generated flocks of crows, with their slogan "We Fly as One." BTW, the Crows have a "19th Man" theme, borrowed from the Seahawks' 12, and a couple of players visited the Seahawks' training facility a couple of years ago and presented Pete Carroll with a Crows guernsey. Aros wrote: Most often, one doesn't have to think outside our planet for a terrestrial phenomenon that looks extraterrestrial. Kind of funny, hearing that from you, Todd. Actually, he's always been pretty good about that. Yep. I may fall into the "Believer" camp when it comes to the ET phenomenon but I am firmly in the belief that 95% of everything classified as a "flying saucer" is normal terrestrial phenomenon. Sorry I don't mean to hijack. Back to the topic, I have always been so mesmerized by those murmurations. I could watch those for hours. Aussie Seahawk wrote: Agreed, Aros - totally amazing. I wonder what flocks of passenger pigeons must have looked like. That's really cool, thanks for sharing!